With fond memories of yesterday’s successful dives we were looking forward to another great day of diving. And we were not disappointed. We were able to put into practice the skills we’ve leaned so far, especially the importance of communicating with our buddy and working as a team. Once we all got to the bottom we diligently worked through our remaining skills before exploring the dive site. We had a lot of fish swimming around us as we moved through the water working on our neutral buoyancy and trim. 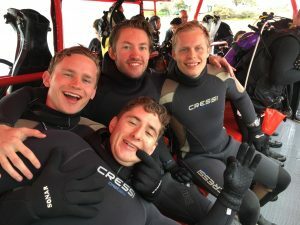 There were big smiles all around during our safety stop, which only grew wider as we climbed back on to the boat, this time as certified open water divers. As icing on the cake we had time to spare before the next group of divers needed to be picked up so on the way back to Portsea we had the opportunity try out our snorkelling skills at Chinaman’s Hat as we swam with the seals.